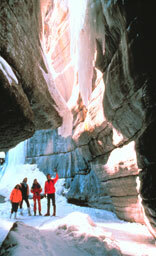 In the 58th issue of the Bed and Breakfast E-Traveller, we take you to Jasper National Park -- Canada's Winter Wonderland. While Jasper offers year-round first-class visitor attractions, activities, facilities and services within magnificently scenic wilderness surroundings, winter in Jasper heralds a quieter, more relaxing ambience. A hush falls over the land, and the beauty of the rocky crags and forests is brightened by winter's blanket of snow. Rivers and streams casually meander, reflecting snowy scenes of splendour. Waterfalls freeze into other-worldly crystal formations. Lakes become frozen winter playgrounds, ringed by awesome peaks. Jasper National Park, a UNESCO world-heritage site, Canada's largest Rocky Mountain park and one of North America's largest natural areas, spans 10,878 sq. km (4,200 sq. mi.) of awe-inspiring scenic splendour. The choice of outdoor activities is limited only by your imagination! Downhill skiing & snowboarding, cross country and backcountry skiing, ice skating, fishing, hiking, snowshoeing, "canyon crawling," ice climbing, wildlife viewing, sightseeing ... to name a few. The rustic small town of Jasper, population 4500, offers small-town charm and world-class amenities and services. Economical private home accommodations and B&Bs abound, to suit any taste and budget. Dozens of restaurants offer cuisine from around the world - and closer to home. Coffee shops ... "Après Ski" refreshments .... nightlife ... whatever your desire, Jasper has it all! The Municipality of Jasper offers superb recreational facilities including the Jasper Aquatic Centre's 25 metre pool, water slide, hot tub and stream room, and the Jasper Activity Centre's fitness centre, squash and racquetball courts, climbing wall, curling rinks, and skating rink. Jasper welcomes you to come and enjoy Jasper In January, fun for the whole family! You'll find plenty of great events and reduced lift ticket prices starting January 15th. Come join us and find out what the fun is all about. Join the Friends of Jasper National Park and Parks Canada for this exciting cross-country ski fundraiser for caribou. Includes a dinner banquet, lots of great prizes, interpretive displays, guest speaker and more. The municipalities of Jasper, Hinton and Edson will play host to the 2006 Alberta Winter Games. Each community will provide the backdrop for young Alberta athletes to test their skills and build strong sporting relationships. Photos courtesy of Jasper Tourism & Commerce.